Easter Island claims to be the most remote inhabited place on Earth, its closest inhabited piece of land is 2'075 km away, and on that island there only live 100 people! Easter Island is most famous for its Moai statues which were erected by the locals and for which all trees of the island were used. What followed was a clan war during which all the statues were toppled over and some partly destroyed. That the statues are standing again is due to a large restoration project, which was started in the later half of the 20th century. 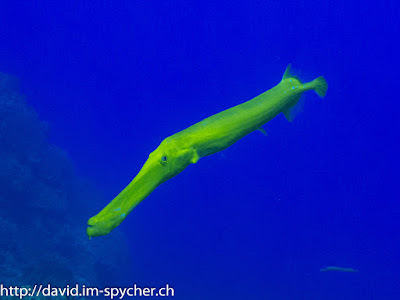 What is not so well known, is that Easter Island is also an interesting diving destination, which I discovered after arranging my stay there. 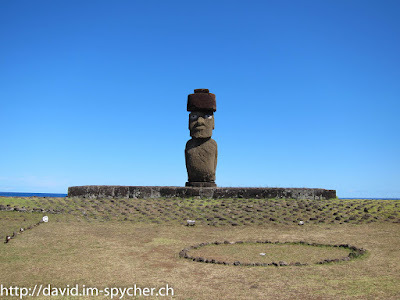 (Originally I didn't want to go to Easter Island, but the only flight connection from South America to French Polynesia stops in Easter Island and so my travel agent rightly suggested I should stop there a couple of days.) The visibility was breathtaking, in some places at least 50 meters and the water was crystal clear. The corals were also in very good shape, the only thing that was lacking were the fish. We did see some fish, but not in the numbers that the reef could have supported. This is mostly due to overfishing. A special highlight was the dive near the harbor, where a fake Moai statue was placed after Hollywood shot a movie on the island. 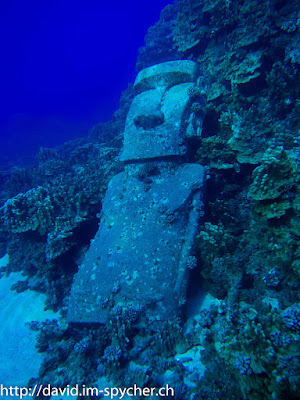 It is a very cool sight if you swim around a block of corals and suddenly see a Moai in front of you :). Because almost everything closed up on Sunday, I used the last two days for sightseeing. First I went to Rano Kau, the former volcano crater in the South-West of the island for Geocaching and Culture. The view of the volcano was breathtaking, it wasn't just a crater lake, but it was filled with small islands and looked almost like a MOOR. 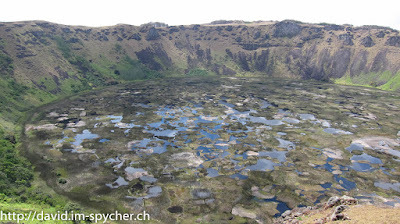 Orongo, the former cultural center is located on the crater rim as well and it was partially restored as part of the National Park and made accessible for tourists. On my last day, I did the truly touristy thing and took part in a full-day tour, which brought us to the quarry, where the Moai were constructed and there we could still see dozens of partially finished or even finished Moai, including the biggest Moai never completed, which was planned to be 21 meters high! 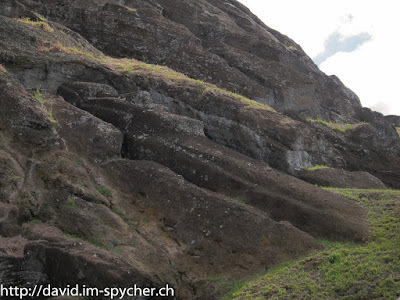 Overall, I stayed 6 "full" days on Easter Island (counting arrival and departure days, because I arrived at 7am and left at 10pm), which was ideal for the combination of diving and sightseeing I did. Just for sightseeing it would have been way too long, it is a small island after all ;). I enjoyed my stay on the island, but it didn't make my list of places I have to go back to, seeing it once was just right. All the pictures can be found in my web album.